How to Enhance Your Backyard This Summer - Legends Landscape Supply Inc.
There’s nothing like enjoying a warm summer breeze from the comfort of your beautiful backyard. Since summer is here and in full swing, why not indulge and truly enjoy your backyard? Here are a few ways that you can enhance your backyard this summer and turn it into the ultimate retreat. 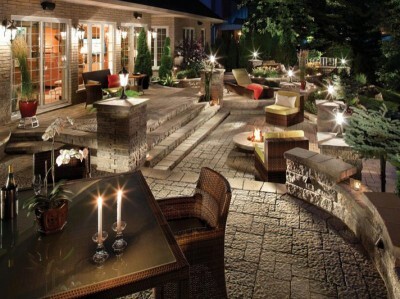 Adding outdoor lighting to your property can be very beneficial. It adds a certain ambiance to your home and backyard, especially when you are entertaining outside. Outdoor lighting can be used to help highlight added features to your home like stone veneer, masonry, waterfalls and gardens. Not only is it aesthetically appealing, but it also enhances safety. Added lighting can help homeowners and visitors to watch their step and ward off any intruders from the well-lit property. Take a look at our landscape lighting gallery for inspiration! You can create beautiful pathways throughout your backyard to help add some variety. Flagstone for example, is very popular for walkways because of its natural look and smooth but gripping walking surface. Adding flagstone walkways to your home can increase property value by up to 15%. You can add to the overall look of your backyard through bountiful gardens. Utilizing gardens for their range of flowers, plants and mulch options can enhance the style of your landscape and backyard. There are so many beautiful options to choose from that can truly accessorize your backyard with bright colours and attractive fragrances. You can contact us today or request a quote to get started on your garden project! Regardless if you are entertaining guests or simply relaxing by yourself, the sound of running water can create a peaceful and natural atmosphere. Water features like fountains and waterfalls can be a beautiful and unique addition to any backyard. With many different styles and sizes to choose from, water features can be customized for any backyard retreat. If you’re in need of some inspiration, take a look at our waterfalls and water features gallery! With the right outdoor kitchen, you can turn your backyard into your own personal getaway! If you’re looking to really spice up your backyard, it might be time for a big change. Additions like patios, cabanas, pool decks and hot tubs can truly change your entire backyard experience. If you feel you aren’t sure where to start with your backyard revamp, adding a new deck or investing in a hot tub might be the change you’re looking for. These investments tend to be more expensive and require more work and planning, but in the end they can truly pay off. Not only can they increase your property value, but they can also provide you with the backyard you’ve always wanted. If you are having trouble getting started or would like some help with revamping your property, contact us today! Legends Landscape Supply creates beautiful landscapes in Burlington, Oakville, Milton, Hamilton, Ancaster, Dundas, Grimsby and Stoney Creek! Request a quote from one of our landscape experts! Written on Thursday, August 11, 2016.